Most likely, we will never stop experiencing abrupt changes and innovations in the dynamically developing world of fashion design. This time around the world is focused on the renowned Hollywood actor of Spanish origin, Antonio Banderas. 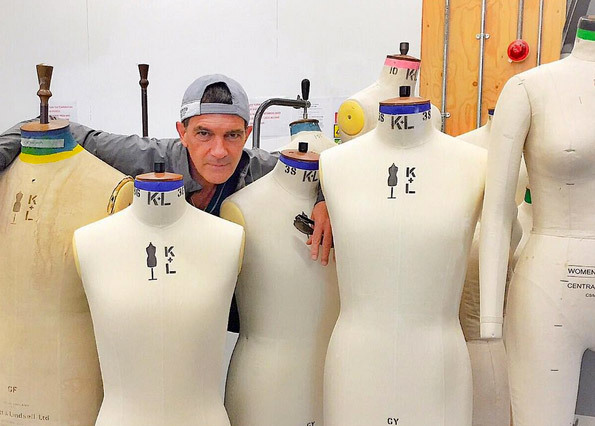 As it has been revealed on the celebrity’s Instagram account, Antonio Banderas is now intending to become an active part of the fashion industry: the 55-year-old “The Mask of Zorro’ star has shared the news with his active followers uploading a photo that informs he is already in his second week of studies at Central St Martins, one of the best art schools in London, England. Such famous fashion icons as Alexander McQueen, Stella McCartney and John Galliano were also the graduates of the school, so we are likely to welcome a new talented fashion designer to the industry shortly. As he puts it, trying his hand at fashion design is somewhat fun and inspiring for him, as putting his elbows on the desk and studying something new is what makes him feel younger. The first question that comes to our mind after his shocking announcement is whether the star is going to leave the cinema world and completely dedicate himself to fashion design. As he himself has confirmed, he will definitely continue acting and directing. So what has stimulated him to throw himself into the fashion design? One of the possible explanations is that maybe in his 55, Banderas is experiencing something like a moral-psychological crisis and he has selected fashion design as a way to overcome it, especially as he has always had an interest in this field. After all he has also split from his wife, Melanie Griffith recently ” a case in point that he is planning a new lifestyle. Or maybe he is seeking to keep up with other celebrities, including Victoria and David Beckhams, Jessica Simpson or Kanye West, who one after another are releasing their stunning collections. As a matter of fact the answer may be too simple ” Banderas is a personality with a vast range of interests. Let us not forget that Banderas is seriously involved in wine-making and possesses a large vineyard. After that his new involvement does not seem that much strange. In all likelihood we will very soon view designed-by-Banderas pieces in the fashion industry. Guessing how his design will look is not an easy thing to hold. Just throw a look at his personal style on the red carpet or during some social events and you will see nothing but black-white classic outfits without any extravagant accessories or hairstyles. Elegance is beyond doubt worthwhile but without pushing boundaries and without searching for new solutions, our star will definitely fail in the fashion world. Maybe he has intended to craft some heroic outfits, like the one that his character wears in “The Mask of Zorro’. But what we see in the “Desperado’ is undeniably much more interesting and intriguing: the style of a wandering and adventurous musician with ponytail hairstyle and his passionate sweetheart with crop tops and messy hair can become an effective start of Banderas’ new career.